Station Hollywood: Remembering Satyajit Ray on 2nd May, 2014. Remembering Satyajit Ray on 2nd May, 2014. Viewers of international films all across the world remember Oscar Winning Director Satyajit Ray on his birth anniversary on 2nd May and death anniversary 23rd April, 2014. Ray was born on 2nd May, 1921, and critics feel it was the birth of legend of legends and probably one of the greatest talents the world has ever produced after Rabindranath Tagore. Ray showed his excellence in every different of film making including script writing, costumes, music direction, costume designing, etc. My father, Chitta Ranjan Chatterji, Ex-Chief Public Prosecutor, Bankshall Court, North, Calcutta, represented Sandip Ray, the son of Satyajit Ray, in a case relating to recovery of manuscripts from Uday Acharya, the brother of Nirmal Acharya, a renowned critic. When the manuscripts of Ray’s films were seized from Udai Acharya’s house and opened from sealed trunk it was seen that they were pictographic in nature. Script of the film Pather Panchali, Gonoshotru had illustrations at every part which showed the secret of Ray’s brilliant characterization in films. Probably some of the actors and actresses in Ray’s films rose to stardom through the images portrayed by Ray. Chabi Biswas mesmerized the film lovers with his dignified performance in the role of Bishambhar Roy in the film Jalsaghar. Charu Prakash Ghosh was unparallel in the role of Birinchibaba in the film Kapurush Mahapurush. Anil Chatterji was unparallel in the role of Post Master in the film Teen Kanya. Utpal Dutt gave his performance for his life in the character Maganlal Meghraj in the film Joy Baba Felunath. Similarly Om Puri and Smita Patil were sublime in their roles in the film Sadgati. Sanjeev Kumar entered the skin of the character played in the film Shatranj Ki Khiladi. 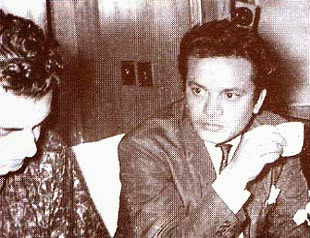 Uttam Kumar could not have been replaced by any other actor in the film Nayak. Karuna Banerjee had made the role of mother of Apu immortal in the film Pather Panchali. Sharmila Tagore was outstanding in the film Debi. Tapen Chatterji and Robi Ghosh are still remembered by filmlovers through their character Goopi Bagha. All the Indian directors like Shyam Benegal, Adoor Gopalakrishnan ,had agreed that they learnt the art of story-telling from Ray’ films. Even the theme music of the legendary director had moved the directors all across the world. Audrey Hepburn, the Oscar winning actress while awarding the Oscar award for lifetime contribution of Ray, said in her speech that Ray’s direction had the soul of Apu in the Apu Trilogy march out from the village of West Bengal and explored India and expressed the struggle for existence of every middle-class individual of the country. Whenever classic literature of novelists and writers were used in films, Ray created his own dimension in those films, including the standard of excellence in the films Charulata and Ghare Baire which were based on the epic literature of Tagore. Films made by Ray from his own literature like Sonar Kella, Joy Baba Felunath, Agantuk, etc., were equally brilliant. The films of Ray should be preserved to disseminate the art of script writing, costume designing, theme music, camera work, neat direction, etc.